A crater lake (and an endorheic lake, meaning it does not flow into the sea), Lago de Atitlan is the deepest lake in Central America, with a maximum depth 340 meters (1,115 feet). The lake is surrounded by the Maya people, whose towns offer a view into the local culture. Three volcanoes loom over the southern bank of the lake, called San Pedro, Tolimn, and Atitlan. The Atitlan Lake formed after a volcanic eruption 84,000 years ago, its name meaning “at the water” in the local Nahuatl language. The volcanoes have left rich soils that are great for the cultivation of typical Central American crops, including coffee and squash, and support a variety of wildlife. Visitors to the lake can participate in many types of water activities, including swimming, diving, and kayaking. Other activities include tours of the volcanoes and hikes around the lake, and experiencing the local culture and markets in the towns. Lago de Atitln is located in the Guatemalan Highlands. 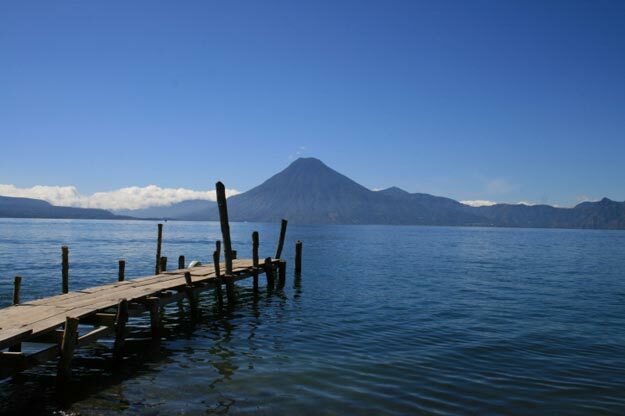 The lake’s surrounding communities include Panajachel, the most tourist-friendly of the towns, Santiago Atitln, San Pedro La Laguna, and San Marcos. Summer in the Guatemalan Highlands is comfortable, warm, and dry. The lake is a great place to cool off if it gets too hot. Summer as well as winter is a busy time for travel in Guatemala, and places can get crowded.